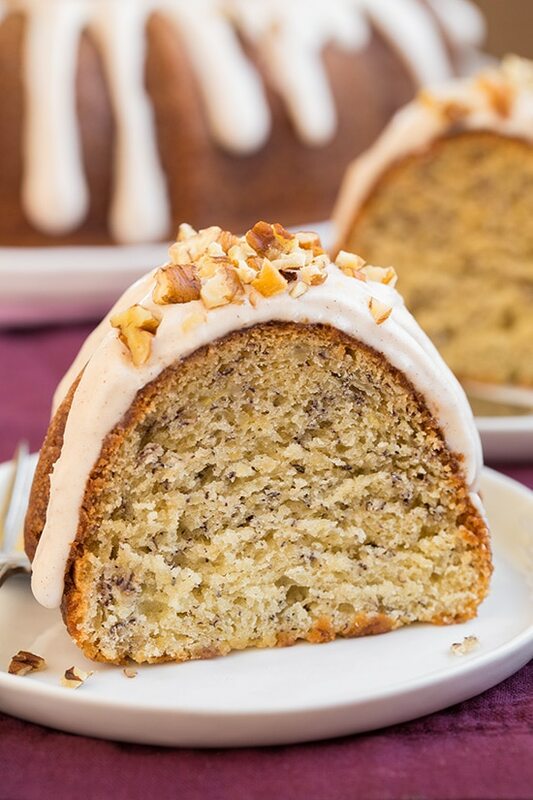 This Banana Bundt Cake is topped with a homemade cream cheese icing and chopped pecans. It’s a dense cake, almost like a pound cake, and is so moist and flavorful! Don’t we all just love a good old fashioned bundt cake recipe? Just like the kind we remember grandma making. One that’s moist, slathered with icing and covered with nuts. Old fashioned recipes are indeed some of the best. Banana bread and banana cake have always been one of my favorite desserts, so anytime I’ve got overripe bananas sitting around I put them to good use (or freeze them for smoothies, never toss out those gems!). 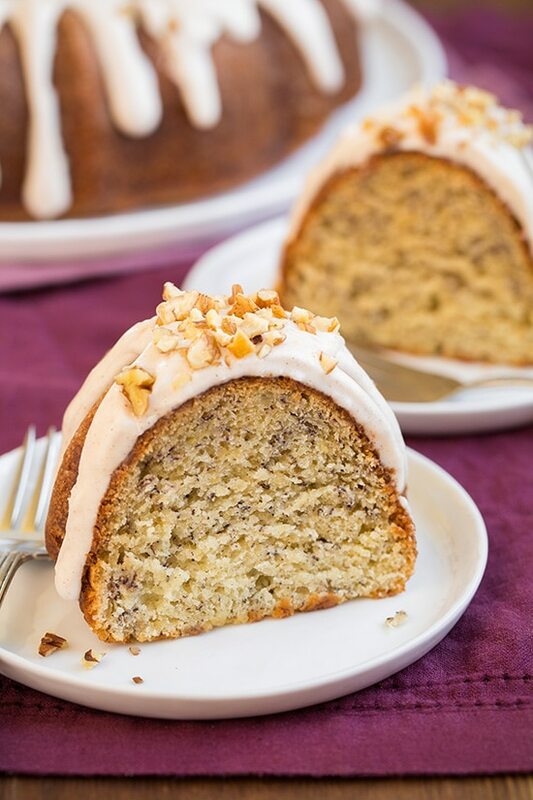 This time, instead of making another loaf of banana bread I switched it up to make a banana bundt cake and give it that special something with a cinnamon cream cheese icing and a generous sprinkling of pecans. And let me tell you, it is amazing! You’ll want slice, after slice, after thin little slice, after just one more little bite. So tempting in all the best ways. The texture of this is much like banana bread in that it’s not very fluffy and delicate. It’s more of a dense, almost pound-cake-like cake. Which is usually what I think of when I think of bundt cakes anyway. Its structure works great for this recipe though as it holds up well to icing, and this cake should stay moist for days. Now what are you waiting for, go put those super speckled bananas on your countertop to good use! 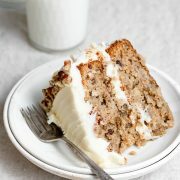 You are going love this combo of banana cake with cinnamon cream cheese icing. It’s a match meant to be. In a separate bowl, whip butter until pale and fluffy, then add sugar and continue whipping. Add eggs one at a time, followed by the vanilla and mashed bananas. Add flour mixture into the butter mixture in increments, alternating with the sour cream. Bake banana cake in greased bundt pan until toothpick inserted in the center comes out clean. Once cooled, spread cinnamon cream cheese icing over top and garnish with chopped pecans. 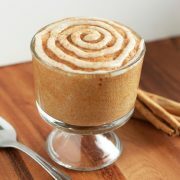 With an electric mixer, whip together cream cheese, vanilla, powdered sugar and cinnamon. Add milk 1 teaspoon at a time until cream cheese icing reaches desired consistency. Can I Use Another Chopped Nut on the Cake? Yes, feel free to use any chopped nuts on top of the cream cheese icing. Chopped walnuts would be delicious atop this cake as well. What Size Bundt Pan Should I Use? 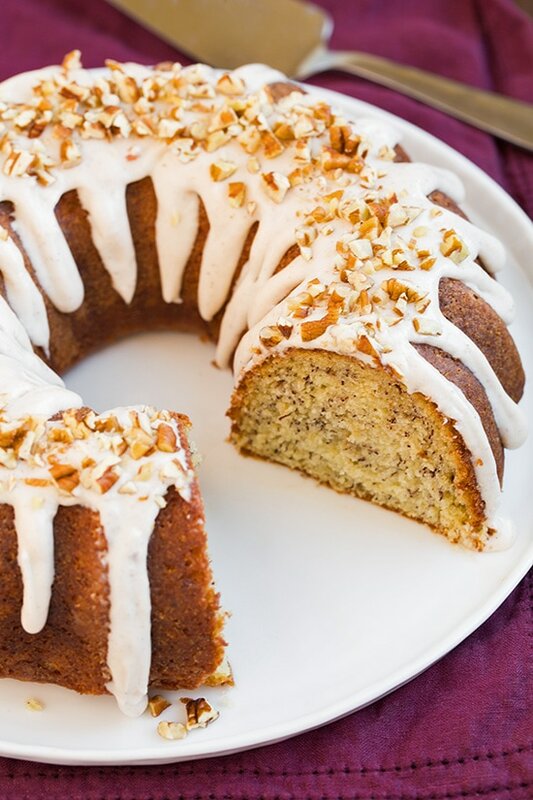 This banana bundt cake recipe should be made using a 10- or 12-cup bundt pan. If you use a 12-inch bundt pan, the cake will need less time in the oven. If you use salted butter in this recipe, omit the additional salt in the cake batter. The cream cheese needs to be softened to room temperature in order to whip up properly for the homemade cream cheese icing. Wait to ice the bundt cake until it’s completely cool, otherwise the icing will slide off and make a mess. Such a tasty way to use up overripe bananas! 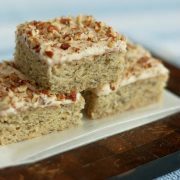 Moist flavorful banana cake is topped with a rich and creamy cream cheese icing and finished with pecans. Preheat oven to 350 degrees. In a mixing bowl whisk together flour, baking powder, baking soda and salt for 20 seconds, set aside. In the bowl of an electric stand mixer fitted with the paddle attachment whip butter until slightly pale and fluffy. Add sugar and mix until pale and fluffy. Mix in eggs one at a time, adding in vanilla with second egg. Blend in mashed banana. Mix in half of the flour mixture, then mix in sour cream. Stir in remaining 1/2 of the flour mixture just until combined. Scrape down sides and bottom of bowl to ensure batter is properly combined. Spray a 10 to 12-cup bundt pan with non-stick spray then dust with flour, shaking out excess. Pour batter into bundt pan, spread into an even layer. Bake in preheated oven until toothpick inserted near center comes out clean, about 40 - 55 minutes (12 cup pan will be more near lesser time). Cool in pan 5 minutes then invert onto a wire rack to cool completely. Once cool spread icing over top and sprinkle with chopped pecans. Store in an airtight container. In the bowl of an electric stand mixer fitted with the paddle attachment, whip together cream cheese, powdered sugar, vanilla and cinnamon. Add in enough milk, 1 tsp at a time, to reach desired consistency. Wati: I’d finished bake this cake last night. It awesome for 1st time trying the recipe. But I substitute sour cream with Greek Yogurt for low calory matter. Leese: Wow!!! This recipe is AMAZING!! I made this last night with great results! It was also my first time weighing my ingredients so I am now over that fear! This cake is moist, very flavorful, and keeps well in the fridge covered or on the counter covered if your home is not too hot. I omitted the cinnamon because my kiddos didn’t want that in their frosting and I added nuts in the batter as well.